"At the end of the world, the adventure begins." Launched in 2007, Pirates of the Caribbean: At World's End is an adventure action movie and the third installment in the successful Pirate of the Caribbean franchise. The film was directed by Gore Verbinski, produced by Jerry Bruckheimer, and written by Ted Elliott. The movie cast includes Johnny Depp, Orlando Bloom, Keira Knightly, and Geoffrey Rush. A production budget of $300 million was spent for the making of Pirates of the Caribbean: At World's End. Later, it grossed a Box Office hit of more than $950 million. The plot starts with a group of captured pirates who are being lined up to be hanged by the infamous E.I. Corporation. One of the capture pirates is only a young boy. Before he is hung, he starts singing a song only pirates know. Meanwhile, the captain of the E.I Corporation, Lord Cutler Beckett, continues to use the powerful ship and crew of Davy Jones to mercilessly destroy pirate ships without offering them a chance to surrender. As a result of the mass killings of pirates, nine of the appointed pirate lords of the Brethren Court hold a meeting at Shipwreck Cove. Although, Captain Jack Sparrow, who was killed in the prequel, has never designated a successor by giving his piece of eight. Captain Barbossa helps Will, Elizabeth, and Calypso to find and rescue Jack from Davy Jones' locker. Unfortunately, the map that leads to Davy Jones' locker is in the hands of another pirate lord named Sao Feng. 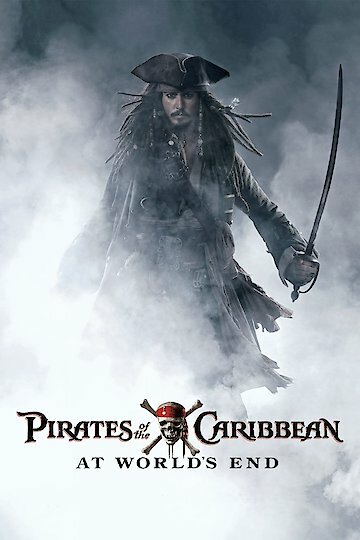 To obtain the map, Will decides to trade the Black Pearl for Jack Sparrow for Will to save his father who is currently a crew member of Davy Jones. Meanwhile, Jones remains under the management of Cutler and continues to annihilate pirate ships. In the end, the two groups meet in an epic battle in the middle of a whirlpool and thunderstorm. Will becomes captain of The Flying Dutchmen and is able to free his father from the curse. Pirates of the Caribbean: At World's End is currently available to watch and stream, download, buy on demand at TNT, Vudu, FandangoNow, iTunes, YouTube VOD online. Johnny Depp Potentially Facing 10 Years in Prison For WHAT? Depp faces a potentially serious charge that may lead to prison time or a massive fine... but you won't believe for what! Disney will be bringing the amazing musical to the big screen. Will Depp join newly cast Meryl Streep?